As the month of Ramadan draws to a close for our Muslim friends and colleagues here and around the world, we cannot but reflect on the many global tragedies that took place during this month. Families losing homes and loved ones, natural disasters and terrorist attacks to name but a few. There are also families in migration camps who only had food every other day. In the face of these misfortunes and heartbreaks, here at home, we cannot but be grateful for the many choices we are blessed to have especially when we break our fast. By the grace and mercy of the Almighty we continue to live in a plentiful, safe and war free environment. On a spiritual and physical level, Ramadan would have been an intense period of worship, reflection and spiritual discipline for Muslims as we strive to draw closer to our Creator. These past four weeks would have also been a time to serve the less fortunate – a reminder of the obligations we have to humanity. In contemplating our obligations to ourselves, our souls, our families and neigbours, as citizens of PETRONAS we need to also reflect and, where necessary, redefine our responsibilities to humanity. The essence of Ramadan to me is to move beyond the day’s hunger and reflect on the purpose of this short journey we are all blessed to be accorded still. 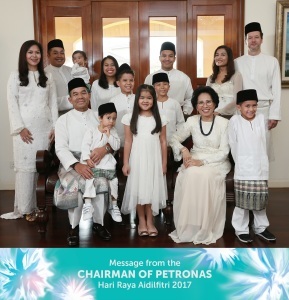 As we open the doors of our homes to our families and friends of other faiths, as our tradition in Malaysia has thrived on during all festivities, it is my hope that we continue to inculcate and imbue the generous culture of PETRONAS both in and out of work – and that is the strength we derive in diversity and respecting others, no matter their creed, colour and race as this results in a richer and more meaningful life than living for the self. The value of empathy, generosity, discipline, respect and integrity which the month has forced us to ponder, are values which PETRONAS was founded on. It is this culture that I have been honoured to be part of and to have partaken in the last 5 years here in PETRONAS. Let us take these shared values that built our company and continue to make this great company stronger. I would like to extend my warmest wishes to all Muslims here and around the world as we celebrate Hari Raya Aidilfitri. I would also like to wish non-Muslim colleagues a blessed holiday. Please keep safe and travel safely to your destinations. Take time to rest between your hectic travels. Finally, my family joins me in wishing everyone at PETRONAS, Selamat Hari Raya Aidilfitri, Maaf Zahir dan Batin. Accept our apologies for any of our shortcomings.